Pugs are heavy shedders and require monthly baths. Your pug's short coat is deceptive — it's actually a double coat, and it sheds surprisingly heavily. Short-haired breeds typically don't require much in the way of grooming, but pugs are an exception to that rule. Regular baths and frequent brushing keep his coat clean and in good condition. Sporting a short, double-layered coat doesn't mean he doesn't get dirty or relieve you of regular bath time duty. Your pug needs a monthly bath to keep clean and remove any lingering odors he may have acquired since his last wash. More frequent bathing can dry and irritate his skin, so unless he's gone frolicking in the mud or found something stinky to play with, stick with a bath schedule of every four to six weeks. Referred to as a “wash and go” breed, your pug technically doesn't need any help to dry himself after baths. A quick wipe down with a towel will remove most of the water and nature will do the rest. You can also use a hairdryer set on a cool temperature to help dry him faster. Watch the temperature, however, as letting your pug air dry in cooler temperatures may encourage a cold. 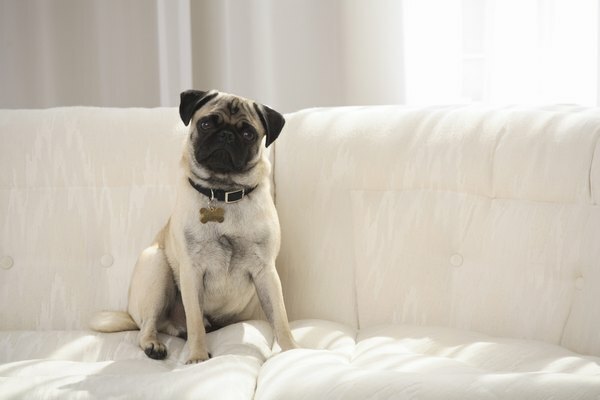 The distinctive wrinkles on your pug's face may tug at your heartstrings, but they can also offer a nice, warm place for fungal infections to form. Don't give them a chance. Wipe out the wrinkles at least a few times a week, and especially after a bath, to make sure they're dry and clean. Use a baby wipe, a cotton ball or a washcloth to get inside them and remove any dirt, oils or moisture that may offer a home to wayward bacteria. You wouldn't know it to look at him, but pugs are heavy shedders, especially in the summer. Their coats are double-layered, offering a smooth, long layer on top and a fluffy, shorter layer underneath. This means you will find their tan hair everywhere. To minimize this, brush him at least a few times a week with a bristle brush or a rubber grooming mitt. The more often you brush, the less hair you'll find everywhere else. Do Border Collies Need a Haircut? How Often Do You Bathe and Brush the Coat of a Shar-Pei? How Often Do I Feed My Pug Puppy?